Awesome, I love Mizner's!! One of my favorite things to do is grab a chocolate martini to sip while listening to that wonderful jazz band play!! Glad to see this place getting some TLC!! I don’t remember ever seeing it full (admittedly, I haven’t visited often). Of course, the Menswear store never seemed busy either. One of my favorite spots! Seems like a pretty long renovation. I always felt like the men’s store added a touch of class to the Grand. Having a real men’s clothing store selling upscale Non-Disney clothing may not have been overly profitable, but it helped to make the Grand feel like a “real” upscale resort to me. Certainly not the end of the world, but seems like a small loss to me. I purchased 2 sets of monorail dress socks there. It's good that they are expanding it as we can never get a seat in there unless we went very early. I have always found it to be packed. It's good to hear that the menswear is moving down to the women's store on the first floor. At least we aren't losing it. While I like mizner's lounge, my wife will miss the selection at the womens store. This creates a problem, I liked to spend time in miners while she shopped. Does this mean she will shop less and I will get less time at the lounge? This could end up being bad for the bottom line. I agree. Back in the 1980s, I remember going on vacation with my family and buying vacation clothes, non-Disney apparel, while on vacation. It is akin to a small upscale boutique one would find at a high-end resort or mall. This makes sense. I always thought, for the GF, Mizners wasnt fancypants enough like the rest of the hotel. Hope they make more room for seats. I agree it never was as nice as it could or should be...espcially touting the Mizner name but having none of the characteristic charm and style of his architectural legacy...Maybe now it will look less like a convention center flex space and more like the swanky lounge it is supposed to be. Watch band or piano player. 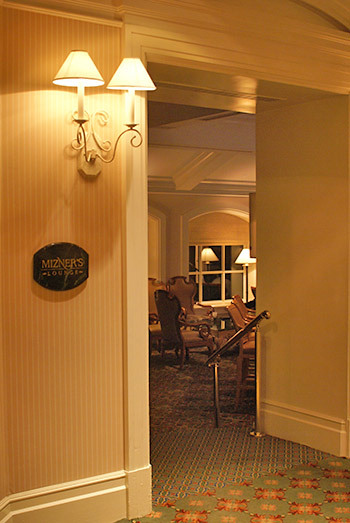 Peek into Mizner's. It's always completely empty. Peek into stores, never buy anything. Grab bottle of beer at Gasparilla's, happy about not having to tip the extra $1. P.S. GF is one of those where I think both pool bars are behind gates, although perhaps not locked? I'm surprised a separate men's shop has lasted this long. The shops at the Grand Floridian harken back to an era at WDW where the original resorts had multiple shops with different wares...both the Contemporary and Polynesian took this approach from 1971 through the mid-1990s and since then their shops have been eliminated/combined/replaced as well. *The Boardwalk is the outlier here. Mizner's is always packed now not just with the resort guests but also with locals who have come to enjoy the atmosphere, the music, and the amazing bar staff. We are arriving end of March through first week of April; the news says the clothing store will be closed April 4, will Mizner’s still be open? Love the place! You mean GASP locals spend money on drinks and nightlife? When we were there last summer it was packed every night. Seeemed to be either from convention groups or wedding parties but it was very busy.